The beautiful lush green suburb of Bardon is inviting to any lover of nature. It beckons you with all its splendour. Any buildings found in this area deserve the utmost care and what better way to achieve this than some quality paint work. Your home represents a picture of who you are both inside and out. It is an avenue for you to express yourself in every way possible. This is usually accomplished with furnishings, but go one step further and add paint into the mix and you have a great piece of work in the form of your house. Our expert painters in Bardon offer residential and commercial painting services.They will listen to your painting requirements you have for your walls and deliver the results you are after. The walls become their blank canvas where they can paint masterpieces. 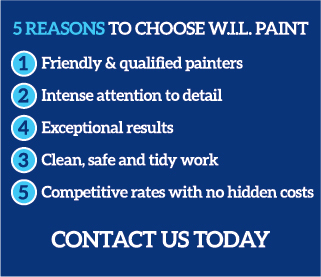 W.I.L Paint painters make this their core business. We use paint to transform houses into homes and offices into comfortable working areas that take your breath away. The passion we have for painting is visible in the way we handle our tasks and the pride we take in our finished product. The walls will speak for themselves and over a long period of time. In all this, we understand that money is an important factor and so we strive to keep our work within your budget without compromising on the quality. There will be no hidden charges and costs because what we quote is what we charge. With us you can expect nothing but quality work at a competitive price. Call us today on 0431 452 312 for a free quote and a great painter.